Following the recent opening of the Barrick Gold Corporation Gallery at the Royal Ontario Museum , the ROMining Game App  is now live. The gallery, located in the ROM’s Teck Suite of Galleries: Earth’s Treasures (Level 2), is an interactive 600 square foot space, with multi-touch, animated displays, multi-media presentations and more. At the heart of this new gallery is the Challenge of Mining game. Featuring a multi-touch table, the game can be played by up to eight players in the Museum and another four mobile players, by downloading the newly available ROMining Game App. 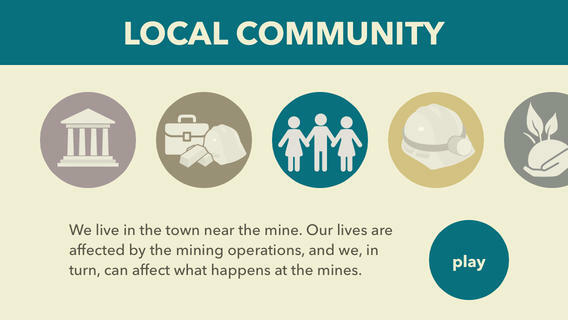 An inter-generational experience, the game requires players to choose a specific character, representative of a mining stakeholder (miner, local community member among them) and, working together, players are challenged to “manage” a successful, ethical, and productive mining operation. This new permanent gallery showcases a range of mineral specimens as well as presentations on the global mining industry, including stories about mining, and how the mining industry impacts our daily lives. The digitally enhanced games and other interactives, such as a touch wall are the most advanced, hands-on, user-driven visitor experiences in the ROM. “The ROM is delighted to share the Barrick Gold Corporation Gallery in our Teck Suite of Galleries with our visitors and inspire them to discover more about mining. From the interactive games to specimen displays, this gallery illustrates the importance of mining in our daily lives and discusses the social and environmental responsibilities surrounding mining as well as our responsibilities as consumers of products of the Earth. We are grateful to our partners and sponsors, including Barrick Gold Corporation and our Advisory Council, for their valued support,” said Janet Carding, ROM Director and CEO. The generous $3M gift from Barrick Gold Corporation will also fund educational programming at the ROM with a new education coordinator role in mining and Earth Sciences, and a classroom in the Museum’s Learning Centre, which welcomes over 150,000 students each year. The ROMining Game App is available now  on iTunes as a free download. It is rated 4+ and requires iOS 6.1 or later. It is compatible with iPhone, iPad, and iPod touch. This app is optimized for iPhone 5. 5 Comments To "Royal Ontario Musuem Launches New ROMining Game App"